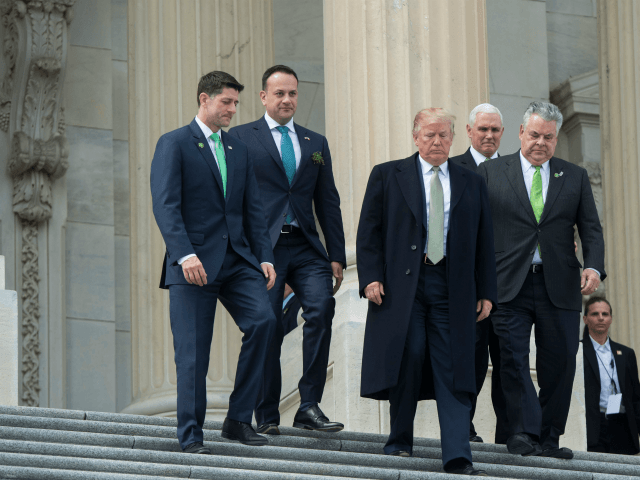 President Donald Trump called for a meeting with House Republicans on Thursday, signaling that he did not want to move forward to fund the government without additional funds for border security. White House Press Secretary Sarah Sanders said in a statement that Trump was not sold on the Republican plan to move forward on a continuing resolution. Trump will meet with House Speaker Paul Ryan, House Majority Leader Kevin McCarthy, and Majority Whip Steve Scalise as well as Freedom Caucus rebels Rep. Jim Jordan and Rep. Mark Meadows. Earlier in the day, Trump signaled on Twitter that he was not pleased that Republicans did not keep their promise to fight for border funding after the midterm election. The Senate passed a continuing resolution on Wednesday night to fund the government until February, but Trump has not publicly supported the plan although Republican senators signaled optimism that he would sign it. The president is feeling heavy pressure from his base and prominent conservatives who are urging him to fight. Earlier in the day, House Republicans canceled a press conference after Trump spoke on the phone with Speaker Ryan.